Guadalupe "Lupe" G. Lopez, 66, entered eternal rest on Saturday, April 14, 2018 at McAllen Medical Center in McAllen. She was born on Friday, April 11, 1952 in Mexico to Eliseo De La Garza and Guadalupe Garcia. She is preceded in death by her parents and sister; Evelia Rodriguez. 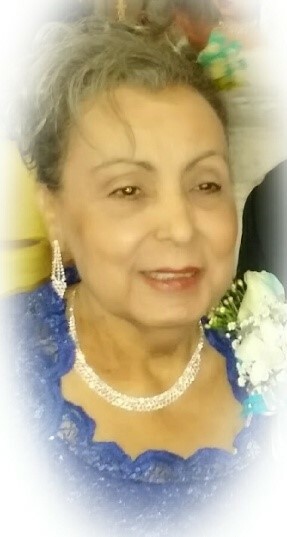 Lupe is survived by her husband of 44 years; Salome Lopez, Sr., sons; Salome (Cristabel) Lopez, Jr., Alex Guadalupe Lopez, and Fabian Ray (Stephanie Isela) Lopez, siblings; Julian (Amparo) De La Garza, Enriqueta (Jesus) Flores, Elisa (Roel) Montes, Eliseo (Dolores) De La Garza, Elvira (Jose) Lopez, Tomasa (Eloy) Saenz, and Rosa (Carlos) Garcia, brother-in-law; Reyes Rodriguez, grandson; Samuel Eliseandro Lopez, numerous nieces and nephews. She worked for Haggars for over 30 years. She enjoyed gardening, sewing, making jewelry, veils and wedding dresses. Her greatest joy was spending time with her family. She will be greatly missed by her family, friends and all those whose lives she touched. Her family received family and friends on Tuesday, April 17, 2018 from 5:00 p.m. - 9:00 p.m. with a Rosary prayed at 7:00 p.m. in the Chapel of Peace at Ceballos-Diaz Funeral Home, 322 East Kuhn Street in Edinburg. Catholic Mass will be celebrated Today, Wednesday, April 18, 2018 at 10:00 a.m. at Sacred Heart Catholic Church, 501 East Kuhn Street. Catholic burial will follow to Hillcrest Memorial Park Cemetery, 1701 East Richardson Road in Edinburg. Having the distinguished honor to serve as pallbearers will be Jerry Reyes, Rolando Lopez, Octavio Flores, Fabian R. Lopez, Alex G. Lopez and Leo Reyes. Funeral services have been entrusted to Ceballos-Diaz Funeral Home in Edinburg.